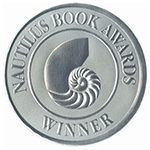 Star Child has been selected for a 2013 Nautilus Silver Medal Award. The award program, which is in its 13th year, also recognized authors Barbara Kingsolver, Marianne Williamson and Jon Kabat-Zinn this year. Previous winners include Deepak Chopra, Desmond Tutu and The Dalai Lama. "Gold and Silver awards are given to print books of exceptional merit that make a literary and heartfelt contribution to spiritual growth, conscious living, high-level wellness, green values, responsible leadership and positive social change, as well as to the worlds of art, creativity and inspiration." ~ Nautilus Book Award website. Many thanks to my many supporters and especially to my publisher, Jan Pogue of Vineyard Stories.